Charlie Todd and Improv Everywhere announced the cities that are participating in the 8th Annual Global No Pants Subway Ride (15th ride in New York, 8th ride with global participation). On Sunday, January 10th, people all over the world will be riding their public transit sans pants, and acting as if nothing is out of the ordinary. Phoenix has participated every year with the No Pants Light Rail Ride, organized by Improv AZ. The No Pants Ride was my first flash mob and the event that launched my interest in flash mob law. Whenever I tell people about this event, one of the common questions I hear is, “Is that legal?” Given that this is a global event, the organizers and participants in each city should review their local laws related to this event and act accordingly. I’m sure it is not fun to be arrested when one is not wearing pants. Given that participants are expected to act as if nothing is abnormal, following the rules of the transit system is expected. Be courteous and don’t interfere with others’ ability to ride the subway, light rail, or bus. And the fact that your outfit doesn’t have pockets does not absolve you from the requirement to purchase a ticket. Many cities have a broadly written catch-all for behaviors that may disturb the peace. If you’re going to organize or participate in a No Pants Ride or other flash mob, always apply common sense to your shenanigans. If you encounter law enforcement, be calm and respectful, and know what information you are required to provide. In the U.S., the police are allowed to briefly detain you if they suspect a crime is occurring or is imminent. And although you have the right to remain silent, you may be required to identify yourself if requested. Of course, the goal of any flash mob is to surprise and entertain an unsuspecting audience. Ideally, the police should never have to be involved. They have real crimes to investigate. It’s up to the organizers and participants to educate themselves on how to pull off their shenanigans without violating the law or anyone’s rights. I’m excited for this year’s No Pants Subway Ride. If one is occurring near you, I highly recommend you participate. If you want to chat about the legalities of flash mobs and pranks, you can contact me directly or connect with me on Twitter, Facebook, YouTube, or LinkedIn. Starting on August 1st, Phoenix is changing to variable prices at its parking meters. Depending on when and where you park, the rate could range from $0.50 to $4.00/hour. This is a big change from the $1.50/hour rate that used to be at every meter. The other big change is enforcement times will be every day from 8 a.m. until 10 p.m. – no more free nights and weekends. The Phoenix City Council said they’re making this change in part because of the city’s $37.7 million deficit and that these new rates will bring in $800,000 for the city. I wonder how much of this expected amount is based on people paying to park versus getting tickets for expired meters. Some people are upset by the increase – like students at the ASU downtown campus and people who work downtown. I’ve seen people on social media say that the increase will decrease the likelihood of them coming downtown, or if they do, that they’ll take the light rail ($4 for an all-day pass is probably cheaper than paying $4/hour to park). On the other hand, the increase has given me a chance to a flash mob I’ve been thinking of for years. My partners-in-crime and I all have day jobs so our shenanigans are mostly restricted to the weekend. I had an idea years ago about being parking meter fairies – dressing up in tutus, wings, and the like and feeding people’s expired meters. Now that people will have to pay to park on the weekends, we’ll finally have a chance to pull this off if we want. Besides my flash mob idea, I wonder if downtown businesses will feed their patrons’ parking meters in front of their establishments or if someone will create a sponsored crew of meter feeders like the Surfers Paradise Meter Maids in Australia. As always, if you want to do a flash mob, do you research in advance to ensure that you don’t set yourself up to get sued or arrested because of your event. If you need a resource, check out my book Flash Mob Law or contact me on Twitter, Facebook, YouTube, LinkedIn, or you can email me. You can also subscribe to the Carter Law Firm newsletter. Please visit my homepage for more information about Carter Law Firm. Recently Improv Everywhere organized a group of 40 agents who donned white MorphsuitsTM to do a prank where they posed as mannequins in the Gap. They all wore Gap-style clothing over their Morphsuits and walked in the store with their masks off. At the designated time the group simultaneously put on their masks and froze in place like the mannequins in the store which are also all white. Some of the employees seemed to think it was funny but one concerned employee called 911. The police showed up and put many of the performers in handcuffs. Charlie Todd, the founder of Improv Everywhere, explained the situation and everyone was released without incident. It was pretty funny overall – even the police were laughing by the end. Let’s look at the legal questions behind this prank. Is It Legal to Enter a Store to do a Prank? That’s an interesting question. Stores are open to the public, even for people who are just browsing and have no intention of buying anything. So it’s legal to enter a store during business hours for reasons other than making a purchase. If you’re not interfering with the store’s operations or others’ ability to shop, you are less likely to have any problems. This is not the first prank that involved messing with store employees. Improv AZ definitely raised some eyebrows when we did the Apple Store Flash Mob and Improv Everywhere had to deal with the police during their Best Buy Prank. Did the Group Commit Trespassing? Probably not. You’re usually not trespassing in a store where the public is welcome to be until you refuse to obey a request that you leave. From what I heard, the group was told to leave the store immediately and peacefully if requested to do so, but the employee called 911 instead. Did the Gap Employee Overreact by Calling 911? I think so. A more reasonable reaction would have been to use the store’s PA system to announce that everyone who was dressed up like a mannequin needed to leave the store and then call the police if they didn’t comply. Is There a Problem with Wearing a Mask in a Store? Possibly. Most businesses don’t have a sign that says “No Masks,” but they are often not allowed. Apparently robbers wear them. Improv AZ ran into a problem with this rule when they tried to walk through a mall (just walking, not doing anything wrong) during the first Epic Super Hero Battle. The group was not allowed to proceed until everyone removed anything that was covering their faces. Is There a Problem with Filming or Taking Photos in a Store? Perhaps. Each store sets its own rules about whether photography or filming is permitted. If you’re doing a prank in a mall, the entire mall may have a rule against shooting photos or videos so do your homework in advance. Be sure to check out Arin Sang-urai’s photos from this prank to see images of the hidden cameras Improv Everywhere used. Could the Group have been Arrested for Disturbing the Peace? Probably not. The group didn’t excessively disrupt the store. I would say the employee did when they called 911. There didn’t appear to be any problems while the police were sorting out what was going on and most people, if not everyone, was smiling by the end. Could the Group be Banned from the Gap? Sure. The store has the right to refuse service to anyone. The have the prerogative to ban problematic patrons. This banning would likely only apply to that particular store, not every Gap, and probably it wouldn’t preclude them from shopping at the Gap online. If anyone was banned from the store, and they entered the premises after the banning began, then they would be trespassing. Some of the members of Improv AZ ran into this problem when we were banned from a mall for three months following the Coroner Prank 2. Please check out Arin Sang-urai’s photos from The Mannequin Mob. They’re outstanding. If you have any questions about the legalities of flash mobs, pranks, or any type of guerrilla marketing, feel free to contact me. If you want a resource about the legal dos and don’ts about these topics, please check out my book, Flash Mob Law. You can also connect with me on Twitter, Google+, Facebook, YouTube, LinkedIn, and you can subscribe to the Carter Law Firm newsletter. It’s the holiday season and with it comes a usual slew of holiday inspired flash mobs. I’ve seen videos this year of groups of bell ringers standing outside stores and carolers in shopping malls. These groups seem to have the best of intentions, but that doesn’t mean that what they’re doing is permissible. So When is a Group probably OK? If a group is on public property (i.e. a public sidewalk or park), not obstructing a thoroughfare or blocking the public’s access to businesses, and not making so much noise that they’re disturbing the peace or violating the city’s noise ordinance, they’re probably ok. Most flash mobs don’t last very long so by the time a scrooge complains to the police, the group will have dispersed before they show up. Shopping malls are private property, including open air malls. The mall is open to the public to shop; however, they get to decide what other activities get to occur at their properties. When patrons are watching a flash mob, they’re not shopping. Some owners don’t like that. I think some malls don’t want to worry about drawing the line between permissible performances and impermissible ones so they don’t allow any of them in the mall. Scottsdale Fashion Square has put all flash mob groups on notice that flash mobs are not allowed on their property and that we’ll be arrested for trespassing if we do a flash mob there. They have real police officers on site so that is a threat they can easily carry out. A group did a dance there in 2010 and they were stopped by police and banned from the mall for a year. What else should you know about Flash Mobs in Malls? Every mall has a set of rules, but they can be hard to find. They might be on an obscure wall or on the mall’s website. When Improv AZ was stopped by mall cops during the Coroner Prank #2, they gave us a list of rules on cards when they banned us from the mall for 3 months. I didn’t see the rules anywhere in the mall and I couldn’t find them on their website. It might be hard to figure out what the rules are and asking for them may arouse suspicion. 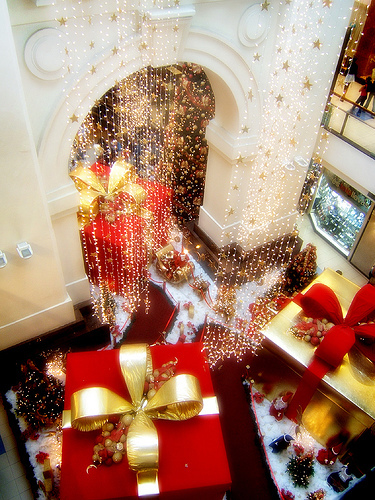 There was one Christmas flash mob in a mall that turned into a safety hazard in 2010. So many people showed up to participate in the singing of Handel’s “Hallelujah Chorus” that there was fears that the floor would buckle. Malls also have limits on capacity set by the fire marshall that you can’t violate with your flash mob. Some malls don’t allow videotaping, which is a common component of doing flash mobs. There’s a possibility that what you’re doing in the mall is permissible but you can’t tape it. Given that when a flash mob starts, a bunch of people are going to whip out their phones and start taping it, so the chances that a mall cop will stop you versus an unsuspecting audience member is pretty low. Are there Copyright Issues with Singing Christmas Carols in Public? It depends. Some holiday songs may not be in the public domain yet. A copyright holder has rights in their work, including control over where their work is performed, for 70 years after the artist dies for all works created after January 1, 1978. Fortunately, I suspect most artists would be happy that you’re promoting their work so they’re unlikely to come after you for copyright infringement even if they could. You can connect with me via Twitter, Google+, Facebook, and LinkedIn, or you can email me. 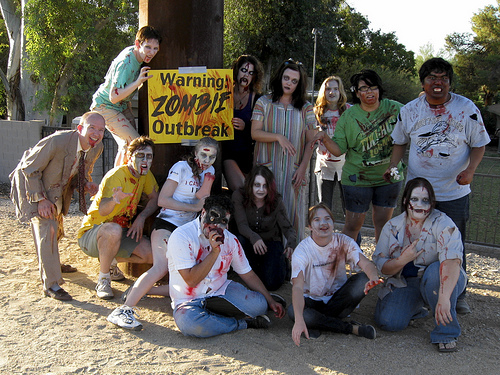 Around Halloween there are a lot of organized zombie walks and zombie races, but we wanted to see what would happen if we created a zombie outbreak in an unexpected location. We had an awesome time entertaining, surprising, and scaring our unsuspecting audience, but was it legal? No. It was a public path. Everyone’s welcome to use it. No. Assault requires intentionally, knowingly, or recklessly causing a physical injury or putting someone in reasonable fear of physical injury. Most of the time we were moving too slowly to get close enough to anyone to even touch them. I doubt anyone thought we were trying to injure anyone. I think they figured out that it was all in good fun. The only time we had physical contact with any runners was when they initiated contact with us with high fives, fist bumps, and one person jokingly threw water at one of us. What About Intimidation? Unlawful Imprisonment? No. That would require us threatening to cause physical injury, serious damage to property, or serious public inconvenience. Public inconvenience is things like forcing the evacuation of a building. Putting people in a situation where they have to run around us – an extra 5 steps to their run – hardly counts as a public inconvenience. Imprisonment requires restraining a person. We may have been in the way, temporarily, but we didn’t prohibit anyone from moving down the path. It’s probably not a public inconvenience if the people are laughing about it while they’re doing it. We did this flash mob to entertain our unsuspecting audience and everyone seemed to have a good time. 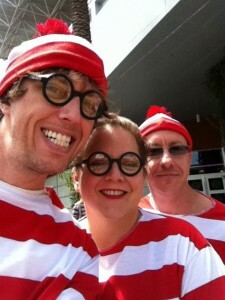 We had a lot of people laugh and make jokes when they saw us. We had to be more careful than zombies in an organized zombie race because at those events the racers know they will be navigating a course where there are zombies who try to attack them. They know and consent in advance to being approached and touched by those zombies so there’s little risk that those zombies will be accused of wrongdoing either. You can check out the video from The Zombathalon here. Feel free to connect with me via Twitter, Google+, Facebook, and LinkedIn, or you can email me. I’m an ABA Legal Rebel! I’m excited to share the news that I’ve been named a 2012 American Bar Association Legal Rebel! The ABA acknowledges 10 members of the legal community each year for being innovative leaders. I am humbled and honored to be added to this illustrious group. I learned about the Legal Rebels when I was in law school at Arizona State University. Every year they invite a panel of Legal Rebels to the school to talk to students about non-traditional career paths. I’m so grateful they hold this event for people like me who need role models who embody the idea that there’s more than one way to be a successful lawyer. I really admire people like Stephanie Kimbro, Niki Black, and Jeffrey Hughes who created some of the roads less traveled in the legal profession. I had a wonderful conversation with Legal Rebel Mark Britton at the ABA TechShow this year. I met him the year before when he visited my law school when I was a 3L. In one year, I had gone from sitting in the audience listening to him speak to sharing the stage with him at LexThink.1. At the end of the event he was very encouraging of me and my firm and said I was “doing everything right” with my career. 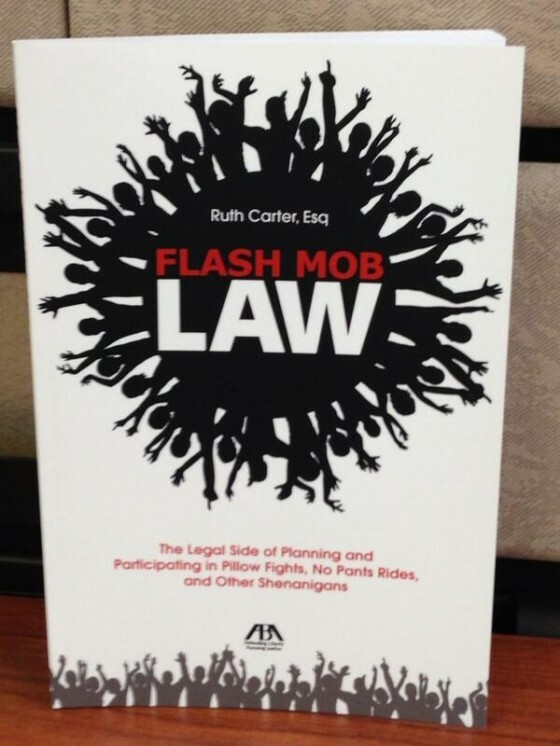 The ABA selected me to be a Legal Rebel for my work in flash mob law. Even though I’ve been a lawyer for less than a year, I’ve examined the legal issues surrounding flash mobs since 2009 when I participated in my first flash mob – the No Pants Light Rail Ride. A group of us from that event decided we wanted to keep doing these events so we co-founded Improv AZ. Before every event, I think through the criminal, First Amendment, tort, property, and intellectual property issues and try to ensure that we aren’t setting ourselves or our participants up to get arrested or sued. I’m also an advocate for the real flash mob community. I try to correct the media when they call group criminal activities or any protest or demonstration organized through social media a “flash mob.” I want to maintain our reputation for organizing surprise events that entertain an unsuspecting audience. I never would have pursued flash mob law without the support of some very special people. I especially want to thank Ari Kaplan who encouraged me to pursue this niche, my fellow Improv AZ co-founders, and my family and friends who encouraged me to follow my dream of being a flash mob lawyer. 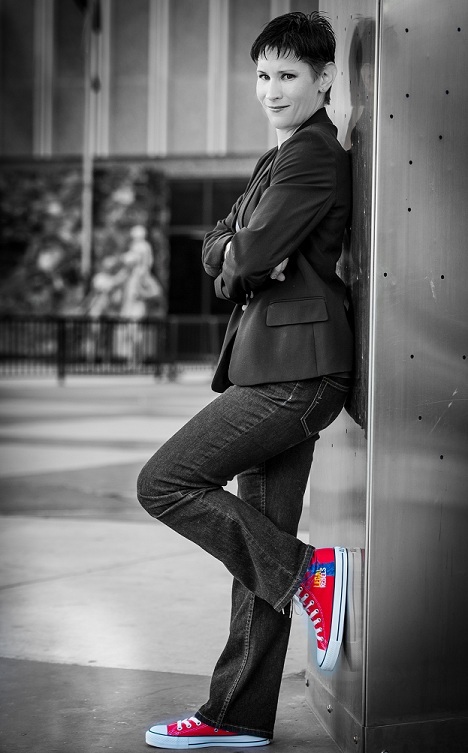 Thank you again to the ABA for bestowing this honor upon me and for my awesome Legal Rebel Converse sneakers! 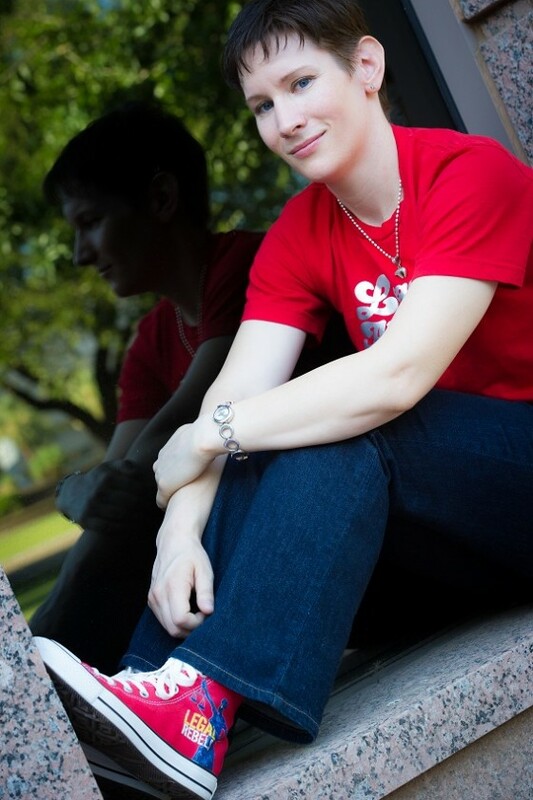 This post was originally published on The Undeniable Ruth in August 2011. It appears the term “flash mob” is being used inappropriately and its meaning is being overly broadened to include any group activity that is coordinated using social media. This year, there have been several robberies and assaults perpetrated by a group of people that appear (at least on the surface) to have been orchestrated via social media sites. The media has called them “flash mob crimes.” They make it sound like someone created a Facebook event that said, “Meet at Broadway and Main at 10pm. At exactly 10:03, we’re all going to run into the minimart, grab whatever we want, and run out.” That’s not a flash mob. That’s solicitation and possibly conspiracy. If the event actually occurs, it’s larceny and perhaps inciting a riot. A flash mob is defined as “a group of people who assemble suddenly in a public place, perform an unusual and sometimes seemingly pointless act for a brief time, then disperse, often for the purposes of entertainment and/or satire.” Flash mobs have been occurring at least since the 1970’s. In recent years, they have been orchestrated via email and social media websites; however, that does not mean that every public group activity that is coordinated via social media is a flash mob. Flash mobs are generally light-hearted innocuous fun. People who participate in flash mobs ride public transportation without their pants; they welcome back strangers at the airport; they have fake battles between heroes and villains; and they stand frozen in place for short periods of time. Some protests and promotional events are referred to as “flash mobs,” but technically they’re not. And any event that has a criminal intent is definitely not a flash mob. I give the media some leeway when it comes to coining terms; however, I was deeply disturbed when I saw a legal website refer to flash mobs as including criminal behavior. It suggests the writer did not do their research on this topic. I love flash mobs. I have been participating in them and organizing them since 2009. When Improv AZ organizes a flash mob, we do thorough research on the potential legal implications of our event. I have attended an event with pages of statutes in my back pocket to ensure that we’re acting within the confines of the law. We are diligent to inform our participants in advance of their do’s and don’ts. We may push the envelope, but we never intend to cross the line. Most of our encounters with police involve them smiling or laughing at us. At the 2010 No Pants Ride after party, a Tempe police car stopped near us and an officer yelled out, “We had a briefing about you!” And then he went about his merry way, knowing we were harmless. A bit odd and rather goofy, but harmless. Flash mobs are harmless, playful, and unexpected events. They are not criminal acts by design. Flash mobs and crimes are two completely different phenomena. They do not exist on the same continuum. In other news, the flash mob community needs to send a big “thank you” to Mayor Jackson and the city of Cleveland. Mayor Jackson recently vetoed a proposed law that would have made it illegal to use social media to coordinate a flash mob. Thank you for protecting our First Amendment rights!